A few years back I made a conscious decision to incorporate a Bible time into our school day. With many reasons for homeschooling my kids, one of them is to give them a solid grounding in their Christian faith and a clear understanding of how it should impact their daily living. Having this as a priority in our day has really made a difference, and it also keeps me on the lookout for ideas to keep this time fresh. We received a 6th grade curriculum from Positive Action for Christ which included both a teacher’s manual and a student workbook. These became our Bible time for the last month and we have enjoyed many aspects of these materials. Details: A Bible study curriculum that includes a teacher guide and student workbook to direct a time of study in God’s Word. Progressive. The great advantage to purchasing a Bible curriculum is that it will have a flow to it. They have taken the time to lay out the material and make sure that topics are covered and build on each other and that the material is age appropriate. Winning the Race is designed for 6th graders that have been in the program before, but we had no trouble picking up where it was. If your child has a familiarity with key Bible stories and doctrines he should have no trouble jumping in at whatever grade level he is at. There was one reference to “as we learned last year,” but it was something all of my kids were familiar with as well. A great beginning. These curriculum books came about as one Sunday School teacher shared what he had created and it simply caught on. People knew a good thing when they saw it, and nearly 40 years have gone by since those early days of what became Positive Action for Christ. Doctrinally sound. It is of course important to me that the Bible curriculum that we use lines up with our doctrinal beliefs. You can take a look at this company’s history and doctrinal statement to see if they match up with yours as well. Engaging. Even though many of my kids do not enjoy actually writing in workbooks, they do enjoy having something in their hands to look at while I teach or read. They took turns with the student book that we had and followed along as we discussed various Scripture references and character qualities. Adaptable. 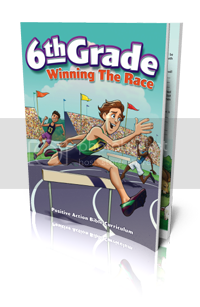 Although we received the book for 6th grade I found it easily adaptable to a wider age range. My 1, 4, and 6 grader definitely gleaned some good information from our time together. It was of course a little young for my 8th grader, but still workable and still prompted some good conversations. Variety. Not just a typical Bible lesson, these units brought up character traits, key verses, life principles, vocabulary, and other activities and teaching strategies. Maybe a little too broad. As each lesson covers memory verses, vocabulary, character, key verses, Bible characters, doctrine, application, and Bible study it was sometimes hard to see how some of the different components fit together. Sometimes I felt like I was stretching a bit to find the link between the key verse and the main Scripture passage. The week did end up being tied together, but not always as naturally as I was hoping, and the memory verses still seemed unrelated, although we did enjoy memorizing part of the Sermon on the Mount. Not really enough material for 5 days. Although it is marketed as a daily Bible lesson for 35 weeks, 3-5 days a week, we did not really find enough to keep us busy each day of the week and we ended up going through the lessons in about 3 days and then just moving on to the next one. This might work well if this is a subject that you only teach a few days a week, or if you have other plans for when you finish the book. More variety in songs would have been nice. I really appreciate that they chose to include hymns in their study. However, when we study a hymn we like to sing it each day that we study it and they only have a new song every 4 weeks. We got a little tired of the same song and moved on much sooner than that. Disclaimer: This product was provided to me free of charge through Positive Action for Christ as part of my participation in The Old Schoolhouse Homeschool Crew. I received no additional compensation and the opinions expressed here come from my personal experiences and sincere thoughts.